The mostly home-schooled teen (she studied at Suttons Bay High School for a year, and graduated a year early from Traverse City West), went to Port-au-Prince, Haiti as one of the volunteer ministers of the Church of Scientology on Feb. 14, and will be there until mid-April. Echo explained why she felt so compelled to help the people of Haiti, whose country was devastated by a massive earthquake on Jan. 12. NBC’s “Today” show reporter Kerry Sanders was in Port-au-Prince, and gave a report on the work of the volunteer ministers. 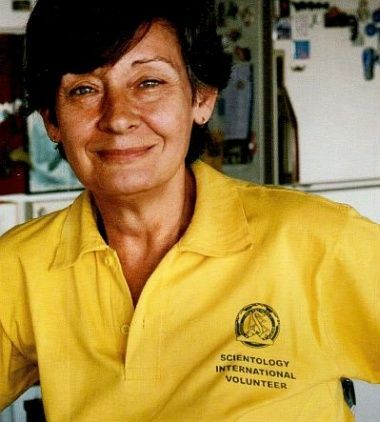 A young volunteer named Nicole, who wore the bright yellow T-shirt that identifies the group, said that the Scientologists are not in Haiti to spread their beliefs. “We don’t even mention religion,” she said, adding that the menial work they were doing was unlikely to make people want to join the church. Echo spent a week in a Christian school giving assists for physical pain and emotional stress, and has helped deliver seminars to aid people in refocusing their attention from the trauma of their situation to productive plans and activities. Her group has recently been cleaning a hospital to prepare it for reopening. “Their work with the Haitians focuses on bringing each individual with whom they work to an improved state of mind, one in which they will be able to look at their situation with hope and certainty of their own individual ability to effect the changes that are needed,” said Echo’s mother, Elisa. On a typical day in Haiti, Echo and the team get up at 7:30 in the morning and gather for a meeting at 8. The 50 to 60 people, including medical teams, decide where they are most needed that day, and then go out to help and deliver the simple and effective assists; the technique is also easy to teach, and those who learn it can then help others. The team has gone to orphanages and refugee camps, and has also given assists to members of the military and medical teams. Scientology Volunteer Ministers bring spiritual first-aid to Filipinos devastated by this year’s typhoons that left tens of thousands homeless. Scientology Volunteer Ministers from the Church of Scientology Mission of Manila responded with help throughout this year’s devastating typhoon season. 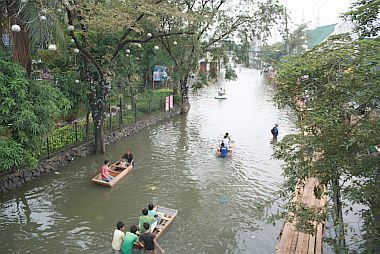 Four deadly typhoons in a two-month period, the last hitting only last week, have caused damage to the sum of nearly 40 billion Philippine pesos (almost $900 million U.S. dollars), killed 961 and left tens of thousands stranded or living in shelters. 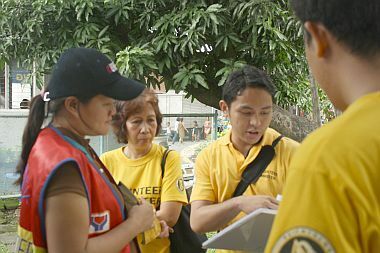 As soon as the first typhoon hit in late September, the staff and parishioners of the Mission of Manila donned their yellow shirts and moved out into the streets and shelters to bring spiritual first-aid in the form of Scientology Assists to those in need. Scientology Assists are techniques developed by Scientology Founder L. Ron Hubbard that address the emotional and spiritual factors in stress, trauma, illness and injury. Philippines President Gloria Arroyo declared a “state of calamity.” The need for effective, fast disaster relief was immediate and immense. To answer these needs the Scientology Volunteer Ministers not only helped on a one-on-one basis, they also trained other volunteers and those stranded in shelters in simple techniques covered in the Scientology Handbook that enable people to overcome seemingly insurmountable barriers and get on with their lives. “Scientology Assists are very easy to learn,” said Ms. Maria Rehyer, Scientology Volunteer Ministers Disaster Response Director. “In half an hour a person can learn enough to help family and friends recover from trauma, shock or injury.” Ms. Rehyer encourages anyone wishing to join the ranks of the 203,000 Scientology Volunteer Ministers to visit http://www.volunteerministers.org/#/courses, where they can enroll on free online courses to learn these techniques. For more information e-mail the Scientology Volunteer Ministers Disaster Response Director at vm@volunteerministers.org or visit the Scientology Volunteer Ministers web site at www.volunteerministers.org. The Scientology Volunteer Ministers India Goodwill Tour is working with the Maharashtra State Civil Defense and Home Guard to equip them with skills they need cope with disaster. Mumbai is the capital of the State of Maharashtra. With an estimated 13,500,000 people living there, it is the largest city in India by population and the 6th largest in the world. Last November’s Mumbai terrorist attacks, with coordinated shooting and bombings throughout the city, brought to light the urgent need for increased disaster preparedness. Among the first groups that rushed to the disaster site were members of the Scientology Volunteer Ministers India Goodwill Tour. 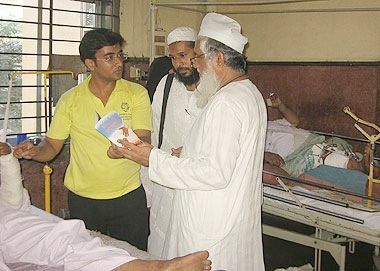 They worked directly with the victims at Sir JJ Hospital. They used Scientology Assists, procedures developed by Scientology founder L. Ron Hubbard that greatly increase the speed of healing by addressing the emotional and spiritual factors in illness and injuries. 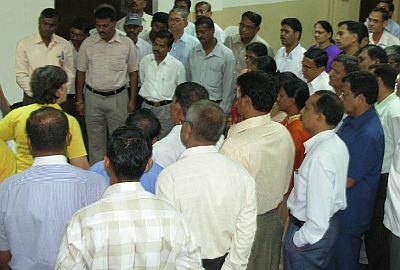 The Scientology volunteers trained the families of the victims and nursing staff and once most of those who had been admitted to the hospital were discharged they reached out with their training to local colleges and Mumbai University to help people become more effective when a crisis occurs. The Maharashtra State Civil Defense Training College heard what the Scientology volunteers were doing, and the effectiveness of their Disaster Relief Training and they were immediately interested. This is the facility that trains the Home Guard—civilians who serve as auxiliary to the police and help maintain internal security. By improving the skill of the Civil Defense Trainers, who train 15,000 civilians a year on civil defense techniques, they would be able to greatly increase the level of security for the state. They arranged for the Scientology Volunteer Ministers to put all the Civil Defense Trainers through a rigorous training program. The program was carried out by the Director of the Goodwill Tour and included training in the technology of study, communication, bringing order to confused situations and assist technology. At their graduation ceremony, many of the students stepped up to the podium to share their views of the program, and gave glowing reports about what they had gained from it. 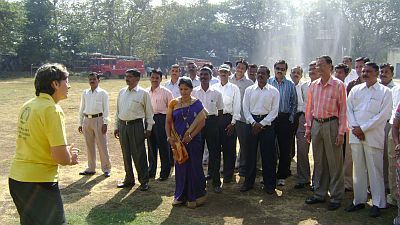 These trainers are now using what they learned to raise the standard of training and skill of the Home Guard so they can better serve the people of Maharashtra. For more information on the Goodwill Tours, visit the Scientology Volunteer Ministers web site or the Scientology site.